Drone Footage Of The Himalayas, in HD! Extreme sports media company based in Jackson Hole, Wyoming, Teton Gravity Research released the first ultra HD drone footage of the Himalayas. The footage shot with the GSS C520 system, one of the most advanced 5-axis gyro-stabilized camera system in the world. Filmed from a helicopter with a crew flying from Kathmandu at 4,600 feet (1,400 meters) up to 24,000 feet (7,300 meters) on supplemental oxygen, these are some of the most stable, crisp, clear aerial shots of these mountains ever released, which include Mount Everest, Ama Dablam, and Lhotse. Sound design and mix by Jeff Cormack at Play+Record. “The Himalayas from 20,000 ft.”. The aerial cinema experts at Teton Gravity Research release the first ultra HD footage of the Himalayas shot from above 20,000 ft. with the GSS C520 system, the most advanced gyro-stabilized camera system in the world. Filmed from a helicopter with a crew flying from Kathmandu at 4,600 ft. up to 24,000 ft. on supplemental oxygen, these are some of the most stable, crisp, clear aerial shots of these mountains ever released, which include Mt. Everest, Ama Dablam, and Lhotse. With 8,848 meters (29,029 ft) (above sea level) at its peak, Mount Everest, also known in Nepal as Sagarmāthā and in Tibet as Chomolungma, is Earth’s highest mountain. It was given its official English name by the Royal Geographical Society upon a recommendation by Andrew Waugh (3 February 1810 – 21 February 1878), the British Surveyor General of India. Waugh named the mountain after his predecessor in the post, Sir George Everest (4 July 1790 — 1 December 1866), the Welsh surveyor and geographer, and the Surveyor General of India from 1830 through 1843. Tenzing Norgay (Sherpa Tenzing, 29 May 1914 – 9 May 1986) and the New Zealand mountaineer, explorer and philanthropist Edmund Hillary (20 July 1919 – 11 January 2008) made the first official ascent of Everest on May 29, 1953 using the southeast ridge route (now also known as the standard route). Ama Dablam is a mountain in the Himalaya range of eastern Nepal. 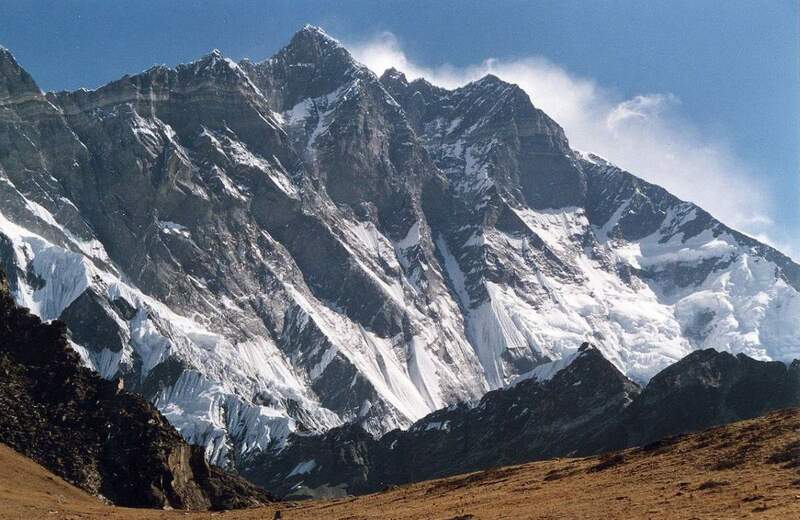 The main peak is 6,812 metres (22,349 ft), the lower western peak is 6,170 metres (20,243 ft). Ama Dablam means “Mother’s necklace”; the long ridges on each side like the arms of a mother (ama) protecting her child, and the hanging glacier thought of as the dablam, the traditional double-pendant containing pictures of the gods, worn by Sherpa women. For several days, Ama Dablam dominates the eastern sky for anyone trekking to Mount Everest basecamp. Ama Dablam was first climbed on 13 March 1961 by Mike Gill (NZ), Barry Bishop (USA), Mike Ward (UK) and Wally Romanes (NZ) via the Southwest Ridge, which is the most popular route by far is the Southwest Ridge (right skyline in the photo). Lhotse is the fourth highest mountain in the world at 8,516 meters (27,940 ft), after Mount Everest (8,848 meters / 29,029 ft), K2 (8,611 meters / 28,251 ft), and Kangchenjunga (8,586 meters / 28,169 ft). The main summit of Lhotse was first climbed on May 18, 1956 by the Swiss team of Ernst Reiss and Fritz Luchsinger from the Swiss Mount Everest/Lhotse Expedition. Previous PostMegatsunami and The Wave (movie)Next PostWhat if a nuclear bomb hit your city?